Hallestraat 4, 8000 Bruges, Belgium. 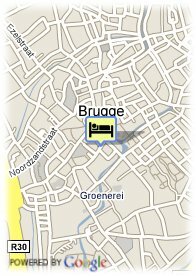 In the cultural heart of Bruges, near the Grote Markt, you'll find this hotel in Bruges in a calm, traffic free street. 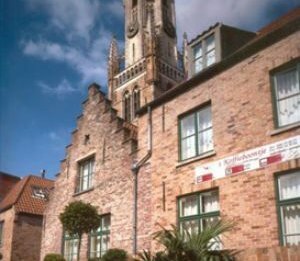 Set in a contemporary architectural structure, you will stay in the middle of the historical centre of Bruges. The terrace provides you with a place to relax, alternatively you can hire a bike so you can discover this beautiful ancient city. In the morning (7.30am until 10am, Sat-Sun until 11am), you can enjoy a rich breakfast buffet that is adapted to the wishes of every hotelguest; national and international. Our hotelguests also receive a reduction card for different museums and boat trips in Bruges, as well as discount in the hotel's own chocolate and souvenir store. Our gastronomic restaurant De Witte Raaf offers you a gastronomical menu with creative dishes. All hotel guests enjoy a 30% discount in our restaurant. For a wide choice of more than 50 Belgian beers, you have to visit the brasserie, Het Stijdershuis. Parking fee required (20.00 €), Paid covered parking at the hotel (20.00 €), Reservation obligated. Less than 2 days and more than 1 day(s) before arrival: 1 night will be charged. Less than 1 day(s) before arrival : 2 nights will be charged. Gastronomic restaurant “DE WITTE RAAF”. In our gastronomic Restaurant “DE WITTE RAAF” you enjoy a gastronomic kitchen with fresh products, in a cosy interior with a nice relaxing atmosphere. Both, our A la Carte dishes and changing market menus will give you the opportunity to taste the finest kitchen. Brasserie Het Strijdershuis. You are welcome from 10 am till midnight in our Brasserie, for snacks, salads, pastas or a variety of tasty dishes. We offer you 50 different beers and a large choice of French and South African wines in all price categories. You are welcome as well to enjoy a pancake, ice cream or to have a drink, in a medieval environment, the oldest part dates from the 12th century. From the terrace you can enjoy a splendid view on the Belfry. At the historical centre of Brugge, in a quiet, trafficfree shopping stret you will find the hotel ‘t Koffieboontje.You will be staying right in the historical centre of the city.